Itsinthepost wins the Grade 2 Charles Whittingham, with substitute rider Julien Leparoux aboard. Baze hesitated. He was in a tight emotional switch. He had just watched another jockey win under the horse he’d ridden in 26 of his 30 American starts. It was tough enough showing up for the race. Now he was asked to be part of the winner’s circle ceremony. In street clothes. On the ground. The bond between horse and jockey is complicated. For a rider, the Thoroughbred race horse is professional challenge and a means to a financial end. Over time, if their association grows, the dynamics of collaboration bleed into personal relationships, sometimes fraught with all the baggage of domestic couples. Laffit Pincay rode Bayakoa in 23 of her 31 North American starts, and had to be ready for her powder-keg personality each time they said “riders up.” His finesse with the rapid mare in the opening jumps always made the difference. Chris McCarron was aboard Paseana for all 28 of her U.S. starts, through the thick of four campaigns and more than $3 million in earnings. He became attuned to the meaning of her every pre-race twitch and tell. Bill Shoemaker would toss and turn the night before he was scheduled to ride the high-stepping Cougar II, a champion and Hall of Famer whose bang-zoom running style needed careful handling. That meant, for Shoe, at least 27 sleepless nights corresponding to the 34 starts Cougar made for Charlie Whittingham. 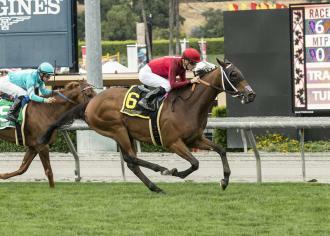 Baze was grounded for last Saturday’s action as a result of badly bruised ribs suffered in a fall at Santa Anita on May 19. A week’s worth of healing managed only to change the color of the deep, painful trauma to the soft tissue of the rib cage. Of course, jockeys ride hurt all the time. Blame didn’t know Garrett Gomez had a broken arm when they beat Zenyatta in the Breeders’ Cup Classic. Gary Stevens, cross-eyed with pain, taped his thumb together long enough to ride Bertrando in the Met Mile. Baze himself had to compensate for compromised vision resulting from facial fractures before corrective goggles restored a clear view. Baze first climbed aboard Itsinthepost in August of 2015 for the gelding’s first American trainer, Darrell Vienna. When Vienna retired, owner Jed Cohen sent his horse to Mullins, and it was no surprise Baze came in the deal. Beginning in January of 2017, Baze and Itsinthepost appeared in 13 straight stakes. They’ve won the San Marcos, San Gabriel, San Luis Rey, and John Henry Turf Championship at Santa Anita and the Elkhorn at Keeneland, while hitting the board in four other events. Baze, despite his injury, was named on Itsinthepost for the Whittingham before stepping aside. Julien Leparoux, in town to ride Hawksmoor in the Grade 1 Gamely, got the call. Baze was asked what he told Leparoux about his horse. The result was a 1 1/4-length victory over Kenjisstorm, after which Leparoux tossed the reins back to Baze, with thanks. Baze suffered his damaged rib cage aboard the Mullins horse Fast Munny, who succumbed to an apparent cardiac arrest during the running of an allowance race. He was being eased by Baze when he dropped suddenly to the ground, slamming his jockey to the firm turf. It takes a while to get over missing a date with your best mount, but Baze did his best.